Major players from across the automotive industry, including Jaguar Land Rover and Westway Nissan, yesterday launched a new initiative to help service leavers and veterans take up jobs in the sector motor industry. Backed by the Ministry of Defence and the Royal Foundation, ‘Mission Automotive’ will help veterans with specialist skills find jobs in a range of roles across the automotive sector, including in engineering, manufacturing, infrastructure and logistics. Central to Mission Automotive is a commitment to the Armed Forces Covenant - a promise by the nation that all those who serve and have served their country should be treated fairly. This includes support for those currently serving, ex-service personnel, and their families, as part of the military community. With full backing from the Royal Foundation of the Duke and Duchess of Cambridge and the Duke and Duchess of Sussex, and the MOD, Mission Automotive will also introduce HR best practice with a focus on the wider issue of corporate responsibility. Mission Automotive was unveiled yesterday at the Royal Hospital Chelsea, and will be delivered by armed forces charity Mission Motorsport, in partnership with Jaguar Land Rover, DHL, Westway Nissan, Alcon and Bicester Heritage, who are all members of the Society of Motor Manufacturers and Traders (SMMT). The charity will also work with the MOD’s Career Transition Partnership to help place personnel leaving the military into jobs in the automotive sector. Since 2014, Mission Motorsport partners have helped 1,700 veterans into new careers, 150 of whom were ex-servicemen and women categorised as wounded, injured or sick. Mission Automotive will build on this success by enabling UK industry to tap into a pool of unrealised talent. It will deliver sustainable and relevant employment opportunities, mapping military career groups to the qualifications required by the sector. Engineering is one of the range of skills which personnel hone in our armed forces and can be transferred to civilian life. Mission Automotive will be instrumental in ensuring that these exceptional skills are harnessed, bolstering this vital sector of our economy and providing high skilled jobs for the ex-forces community. A career in the armed forces sets our people up with skills that last a lifetime, with their team work, courage and self-discipline making them an asset to any employer. Under the Armed Forces Covenant, we all have a duty to support military personnel, both while they are serving and beyond, and I applaud Mission Automotive for their commitment to championing our people as they take the next step in their professional lives. Mission Automotive unveiled at the Royal Hospital Chelsea. The Covenant is fulfilled by the UK Government, charities, businesses, and the public sector, and support covers a number of areas, including education, housing, careers, healthcare, and financial assistance. Over 3,000 businesses and organisations have now signed the Armed Forces Covenant, committing to support the careers of former and current service personnel and military partners. Many service leavers and veterans struggle to attain their potential, unable to recognise where they will fit into civilian careers. 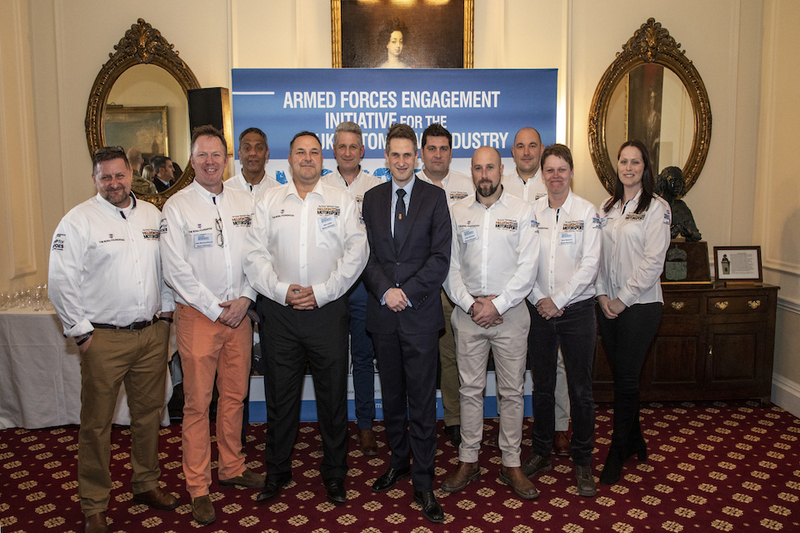 Mission Automotive helps organisations to recognize, foster and retain that talent through developing and implementing their own Armed Forces engagement strategies. By promoting these positive business behaviours, the Mission Automotive initiative gives member companies the tools to unlock not only human potential, but also brand and corporate opportunities through embracing the Armed Forces Covenant. Working as part of the MoD’s Defence Recovery Capability, our partner companies have helped over 1700 veterans into employment since the first Invictus Games in 2014. Our service men and women are a national resource, and have much to offer to society beyond their military service. By helping them and their families we boost British industry, and by association the communities in which they resettle. SMMT is delighted to be a partner in the launch of Mission Automotive. We have sought to support Mission Motorsport over a number of years both in terms of grant support and helping connect them and the veterans and service leavers that they support with the wider automotive industry. The work they do is helping the industry address critical skills gaps and, more importantly, providing a new career path for ex-Service people who rapidly become an asset to the companies involved.